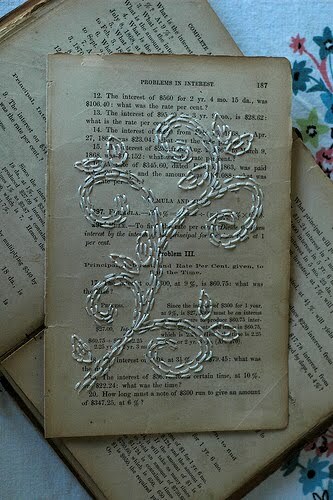 But until I came across the work of Jessica A. Kelly of Paper Stitch, I had never thought of embroidering on book pages. What she does is impressive, especially to math-challenged folks like myself. 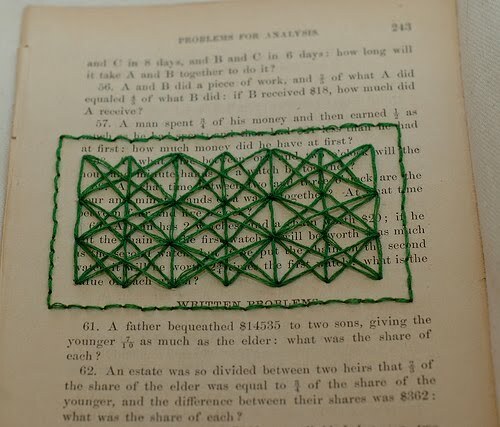 Jessica combines her love of numbers, patterns, symmetry, and margin doodling by creating one of a kind embroideries on vintage textbook pages. 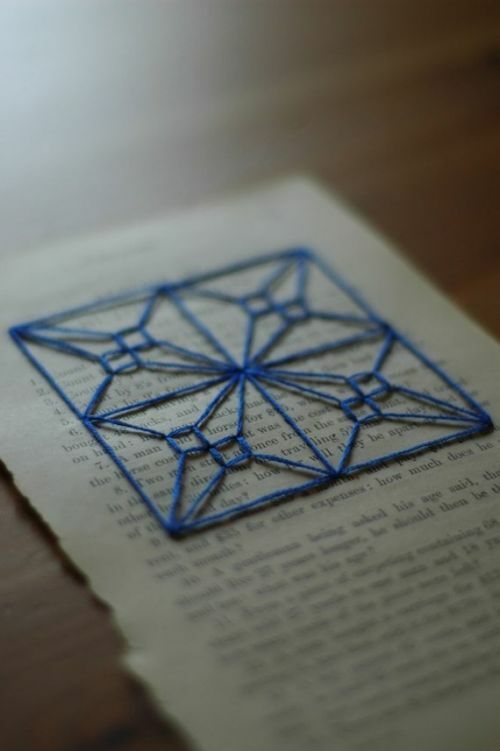 She was born into a family of self-taught crafters, but hasn't been stitching for very long. One day Jessica noticed line drawings while flipping through a math book from the mid-1800s that she had bought for fifty cents. Next she began doodling as she often does in book margins, but instead spread her doodles across the entire page... and the idea for a graph series was born. I'm picturing a set of these geometrics matted, framed, and hung as a clustered grouping. 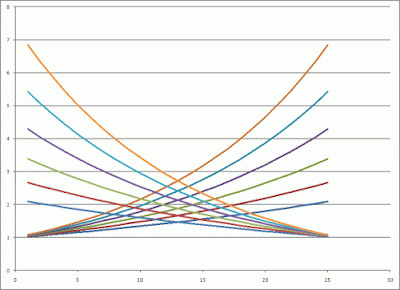 Here Jessica used the data on a page that showed compound interest on $1 at 3-8% and graphed the curves as a stitched pattern. 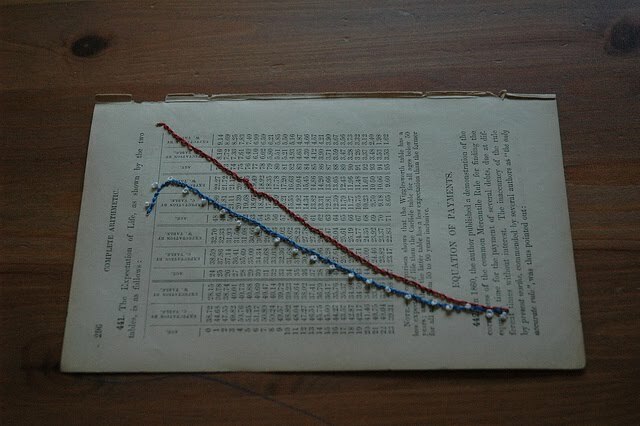 And this next one is a graph of K3.3 from one of her old math textbooks. And if K3.3 means something to you, you are obviously lots farther along in your math education than I. 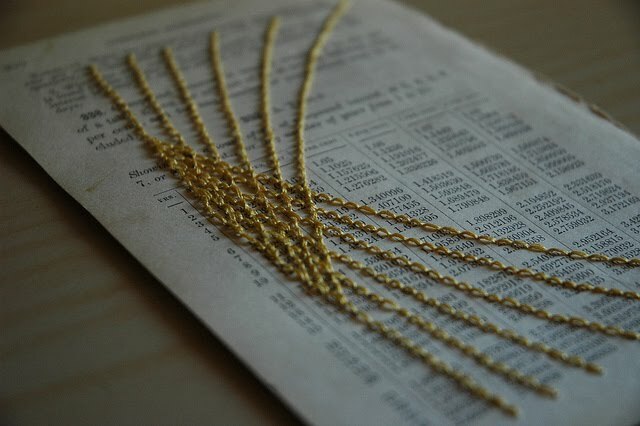 If you would like to give embroidering on paper a try, Jessica has posted a helpful how to stitch on paper tutorial. At the moment she is working on mostly non-paper pieces referencing the 1930s, though she's sure some paper pieces will work their way into the mix. By the way, thanks so much for the lovely messages about the site redesign. Today is my second blogiversary (hard to believe!) and it feels really good to have a fresh look to mark the occasion. Thanks so much for the kind words, Ann! Much cleaner, more elegant in its simplicity. The new header is prettier and neater too! Unusual and creative work by Kelly. Happy blogiversary Ann! Jessica is really talented and I loved visiting her blog. Shea, yes, Brian's work is jaw-droppingly great! Good point about no email addy on the front page... have remedied that. This is right up my alley. I love it! Fantastic work. Happy blogiversary, Ann! I love your redesign - so clean and stylish. And happy blogoversary -- the place looks great! Happy anniversary Ann! The blog looks really great! Congratulations on the anniversary and the blog redesign. It looks great!! I've been meaning to work on mine for ages now, but it keeps getting pushed to the back burner, especially these days! hi Ann! the new design looks great! 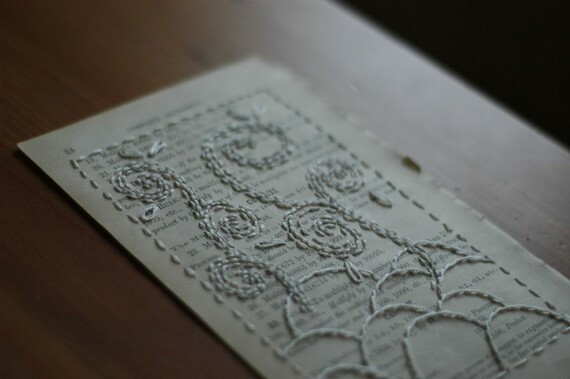 and book embroidering is stunning, so awesome that she combines what is actually on the page with her work. I like your new look very much - minimalistic, but very pretty. What an original idea! Thanks. 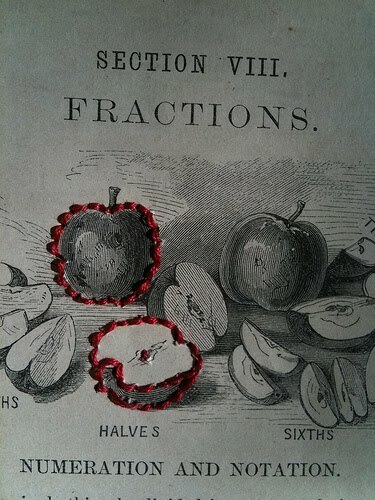 I've seen altered books but never with embroidery. Interesting. I migh try some of the patterns. Oh, wow! Like you, I've spent a lot of years with needle & floss in hand, but am now a paper addict. But this combination - beautiful! 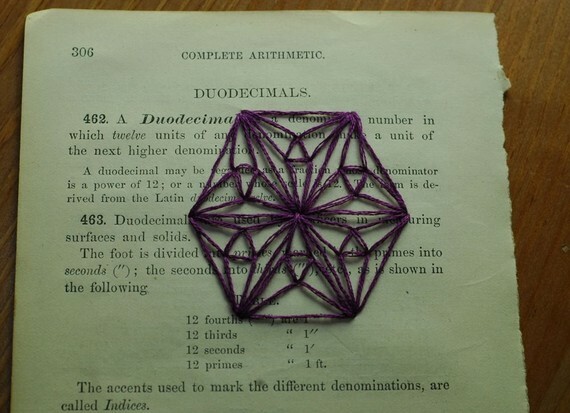 I started recently to save some old books but I've never thought at those gorgeous things!